It always makes for a beautiful video whenever the suns lashes out with a solar flare. Here’s one from earlier this month, you can see how electric its movement are, it just whips up and explodes. The footage was captured in different wavelengths and then color coded so we can see what’s happening in better detail. In this case, in 4K detail. On April 17, 2016, an active region on the sun’s right side released a mid-level solar flare, captured here by NASA’s Solar Dynamics Observatory. 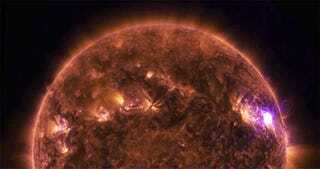 This solar flare caused moderate radio blackouts, according to NOAA’s Space Weather Prediction Center. Scientists study active regions – which are areas of intense magnetism – to better understand why they sometimes erupt with such flares. This video was captured in several wavelengths of extreme ultraviolet light, a type of light that is typically invisible to our eyes, but is color-coded in SDO images for easy viewing.